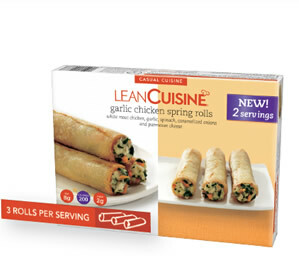 Lean Cuisine Spring Rolls sell for a suggested retail price of $3.59 and are available in three flavors: Garlic Chicken—white meat chicken, garlic, spinach, caramelized onions and Parmesan cheese; Thai-Style Chicken—white meat chicken, shredded cabbage, julienne yellow carrots and spicy red coconut curry; and Fajita-Style Chicken—white meat chipotle, corn, black beans, bell peppers and onions. TFFG SAYS: This is a good fusion of two key trends: 1. The move toward healthier choices, in this case a product with a healthy protein (chicken) flavored with vegetables; and 2. The growing popularity of Asian foods, noted by the continued growth of restaurants featuring Asian cuisine and the popularity of such foods first made popular in Asian cultures, like sushi and soy products. Lean Cuisine is also making some key information available on its LeanCusine.com website. In addition to a “Where To Buy” feature which helps shoppers locate Spring Rolls and other Lean Cuisine products in the nearest supermarket, the site offers wellness resources, including meal planning, lifestyle tips and advice.